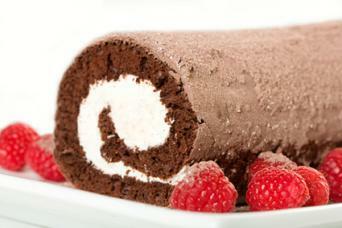 The word roulade is derived from the French word rouler, which means "to roll." In the culinary world, a roulade has a number of sweet and savory applications that make visually appealing and delicious dishes. In cooking, roulade is a term for a rolled dish. Typically, one food is rolled around another and sliced lengthwise into pinwheels. Roulades can have pastry applications, such as those made from a cake and filling, or they can be savory, with meat wrapped around some type of filling or stuffing. Pastry roulades are also called jelly rolls or Swiss rolls. The most common outer layer in a pastry roulade is a flat sponge-type cake rolled around a sweet filling. The cake can be any flavor. Grease the pan. Next, line the greased pan with parchment. Then, grease and flour the parchment. This allows the cake to release easily. After baking the cake, lay a large cotton tea towel on the counter and sprinkle it with powdered sugar. The powdered sugar will keep the cake from sticking to the towel. Run a butter knife gently around the edges of the cake as soon as it comes out of the oven. Then, invert the pan immediately onto the towel. Roll the towel around the cake into a loose spiral. Set it on a wire baking rack with the seam side down to cool completely. Filling the roulade with one of these fillings is easy. Unroll the completely cooled cake and lay it flat on the counter. Using a rubber spatula, spread the filling evenly across the cake. Rolling the roulade requires careful attention to detail. Some people use the towel to help guide the rolling, but it isn't necessary. 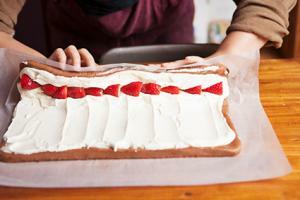 To roll the roulade, you use the width (the short edge) of the cake. Start rolling along the bottom short edge of the cake. Start with a tight spiral. Continue rolling along the length, keeping the cake tight around the filling, until you roll it into a long spiral. Don't roll so tightly that you squish out all the filling, but roll tightly enough that there are no air pockets in the spiral. When you finish, turn the roulade onto a platter with the seam side down. The most common garnish for a pastry roulade is a sprinkling of confectioner's sugar. However, some roulades may have glazes, as well. It depends on the recipe. To garnish with powdered sugar, put about 1/4 cup of confectioner's sugar in a fine mesh sieve. Tapping the side of the sieve, sprinkle the sugar evenly over the whole roulade. Consider freezing the roulade for about an hour so it sets up firmly and is easier to slice. If you do freeze it, don't put the powdered sugar on until after you take it out of the freezer. Use a serrated knife, cutting with a gentle back and forth motion. Dip your knife in warm water before each slice. Do not press hard with the knife, or you might squish the roulade. 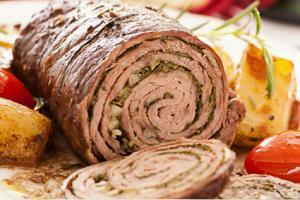 Meat roulades feature some type of meat, fish, or poultry wrapped around a savory filling. To prepare the meat, you need to give it even thickness throughout so that it rolls evenly around your filling. You may start with a piece of meat that is thin and even and rolls perfectly. However, more frequently you'll need to flatten the meat by butterflying it and then pound it to an even thickness. 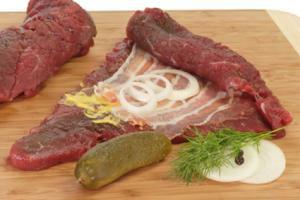 Lay the meat flat on a cutting board. Place your hand on top of the meat to hold it in place. Using a chef's knife and working along the length of the meat, slice the meat horizontally at the halfway point into two layers, stopping before you cut all the way through to the other side. Unfold the meat like you would open a book, leaving the intact seam in the center. Cover your cutting board with plastic wrap. Lay the meat on top of it. Now lay a second piece of plastic over the top of the meat. Using the smooth side of a meat mallet, pound the meat until it is of even thickness, about 1/4 to 1/2-inch thick. Seasoning the meat is simple. Sprinkle a generous amount of salt and pepper on both sides of the meat. When filling the roulade, it is important that if you are using a cooked filling, it has cooled completely before spreading it on the meat. This is a safety issue because warm filling may bring the meat up to an unsafe temperature that encourages bacterial growth. Depending on the type of filling you use, you can either spread it evenly over the meat (for a purée), or place it in a long "log" shape lengthwise along the center of the meat. Fold the sides of the meat up and over the filling, covering it completely. Tie the meat at even intervals to hold its shape. You will roll the roulade starting along the length (the long edge). Roll the long edge in a tight spiral around the filling, working your way along the width of the meat until it is completely rolled in a pinwheel fashion. Use butcher's twine to tie it shut at regular intervals. Without overcrowding the pan (which will cause the meat to steam instead of brown) brown the roulade on all sides, about four minutes per side. Work in batches if necessary. Transfer the roulade to a roasting pan and bake until the meat reaches a safe temperature. This varies depending on the type of meat and the cooking temperature. Once you've removed the roulade from the oven, set it aside, tented with foil, and allow it to rest for about 10 minutes. Use a very sharp chef's knife. Do not slice until the roulade has rested for those 10 minutes, which gives the filling time to set and the juices from the meat to reabsorb into the meat's fibers. Slice the roulade across the width, cutting it into half-inch to one-inch thick pinwheels. You can leave your roulade as is, sprinkle it with a few fresh herbs for flavor, or make a lovely pan sauce. To make the pan sauce, put the pan in which you cooked the roulade in on the stove over medium-high heat. Add one cup of liquid, like wine, stock, vinegar, or lemon juice. Use the side of a spoon to scrape the browned bits from the bottom of the pan. Reduce the heat to medium-low and allow the liquid to simmer. Add any herbs you wish. When the liquid has reduced by half - about 10 minutes of simmering - swirl in about 1/4 cup of very cold butter cut into pieces, one piece at a time. Whether you make a sweet or savory roulade, or both, these visually appealing meals are easy to prepare and beautiful on the plate. Try making one for your family for a meal that is certain to impress.